Sign up for our free Newsletter, find us on facebook, follow us on Twitter, YouTube, Instagram and Pinterest. Ticks, who are in the family of spiders & mites, can be potentially life changing. They are tiny – from the size of a pin head to a sesame seed – and they prefer to hang out in long grass, bracken, under trees, among leaf litter as well as in sand dunes & pastureland. They’re commonly associated with deer, although ticks are usually carried in the earlier stages of development by ground feeding birds such as robins, thrushes & blackbirds as well as the common garden mouse. Even hedgehogs & squirrels can carry ticks & it’s often these smaller hosts that transmit a serious infection called Lyme disease onto the feeding tick. Once a tick has fed, they go into hiding to enable them to moult & mature into the next life stage. Unfortunately once they are ready to feed again they will carry the Lyme disease bacteria in their gut meaning the next blood meal (be it you, a child, a pet, a bird or animal) could be infected with nasty bacteria. The Lyme bacteria known as borrelia is spirochetal, meaning it can burrow its way through blood, tissue & get into joints & organs. Due to the way it spreads it can cause a variety of symptoms, hence affecting people in lots of different ways. In early Lyme disease stages, a singular rash, known as a bulls-eye rash, ‘may’ appear at the site of the bite within days to weeks of the bite which can gradually enlarge into rings resembling a dartboard. It’s important to note that not everyone gets this rash & it doesn’t always look ring shaped, sometimes it can be uniform in nature & sometimes multiple rashes can occur. 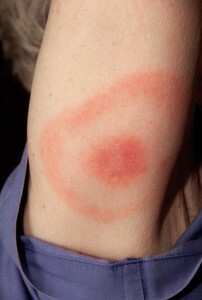 The rash ‘tends’ not be painful or itchy unless a secondary infection has settled in during the tick bite. 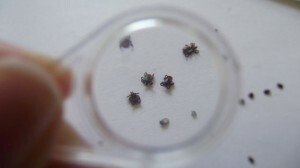 However any rash following a tick bite should be taken seriously as early treatment can prevent a more serious disease developing. Some patients may experience summertime flu, which after a tick bite is also a sign that infection may have taken hold. 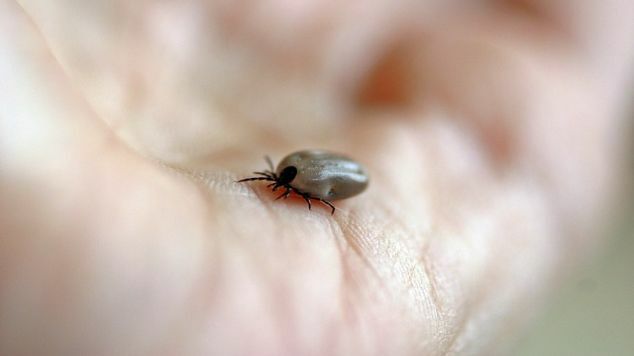 At this stage testing is usually negative so a doctor MUST treat immediately on suspicion of Lyme disease, especially if a tick bite has been reported. in very rare cases temporary or permanent paralysis can occur so prevention is much better than cure. Patients can also be misdiagnosed with cross over illnesses such as Multiple Sclerosis or ME / Chronic Fatigue Syndrome. Antibodies may develop slowly & testing can be inconclusive making diagnosis difficult. 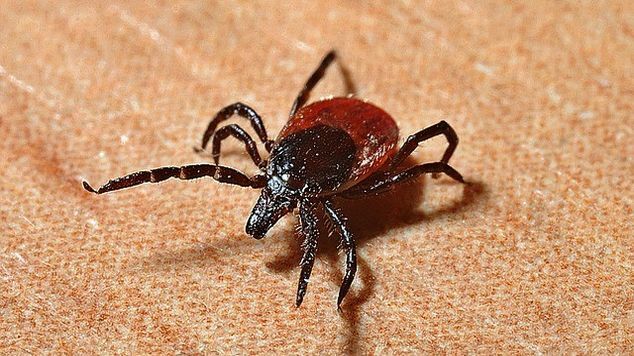 Not all ticks will be infected, studies in Kerry showed tick infection rates from 11-29% plus some patients may be carriers without showing symptoms, but it’s good to be aware of the dangers. Ticks feed by crawling up tall grasses & holding their legs out (called a questing position). Using little hooks on their legs they can attach themselves to fur or clothing as the hosts pass by. use tick repellents on pets & humans. Some repellents are poisonous to cats so check the bottle to be sure. check regularly for ticks. Remember that ticks can still sneak past some repellents so check the outside of clothing whilst out walking, before getting into the car and around the body as soon as you get home. when checking for ticks on the body look in tucked away places such as behind the ear, back of knee, in the groin regions etc. They prefer thinner skin that’s well hidden so could be easy to miss. remember to check inside shoes as well. If you walk or camp regularly, look out for sprays containing permethrin, this has to be applied to material only, not the skin, but it lasts for several washes before you need to re-apply. If you have saved the tick after removal you can put it in a plastic freezer bag or sample pot & place it in the freezer. Laboratories can test the tick for infections if you are concerned. Some say a tick needs to be on you for long periods of time to transmit any disease, however as research & opinions vary on this, we feel it’s best to be vigilant for symptoms, however long the tick has been feeding. In this video, natural historian David Bellamy, OBE, and TV Vet Steve Leonard discuss ticks in detail, including their life-cycle, the disease risks they pose and how to safely remove ticks from your pet. Visit the Tick Talk Ireland website at ticktalkireland.org or email [email protected] for more information. Let us know if you spot any ticks using our Tick Talking while You’re Walking survey! Over to you now. What’s your experience of preventing tick bites? Any tips to share in the comments below?